At D-Tek Live Bee Removal, we love bees! We find them to be endlessly fascinating creatures. And we are not alone – bees are one of the most studied animals due to the vital role they play in our ecosystem. 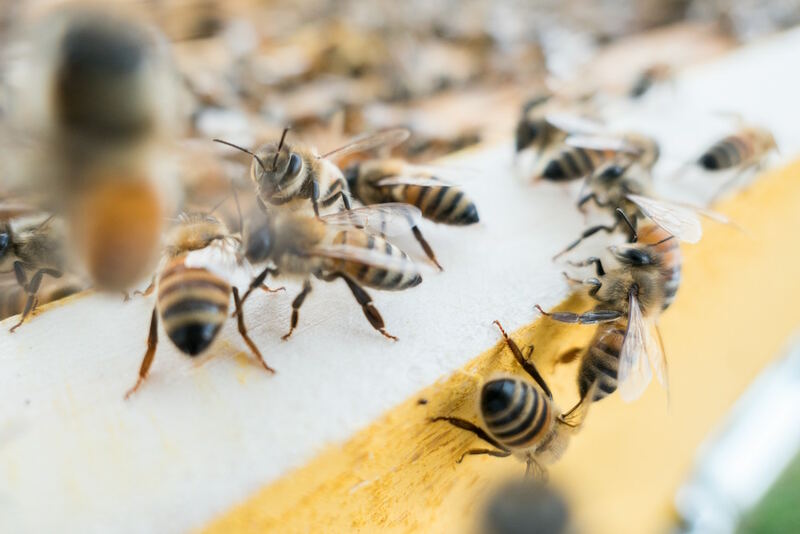 On our blog, we talk a lot about honey bees: their behavior, the effect they have on our world and the safest and most humane methods for live bee removal. In this post, we want to simply celebrate the amazing bee by sharing some of our favorite bee facts. There is always more to learn about the honey bee! Beekeeping is one of the oldest professions. Although opinions vary, honey bees are thought to have existed up to 150 million years ago. Early records indicate that humans were consuming honey about 10,000 years ago. The top 10 honey producing states in the United States are North Dakota, South Dakota, California, Montana, Florida, Texas, Minnesota, Idaho, Louisiana and Washington. A honey bee produces about 1/12 of a teaspoon of honey in its lifetime. A worker bee lives an average of 6-8 weeks. A single colony of honey bees can produce between 60 and 100 pounds of honey per year. Honeycomb cells have a number of functions. Not only do they store honey, but they also hold nectar, pollen, and water. The cells even act as a nursery, housing the larvae until they mature into honey bees. Bee colonies can be huge. At their peak, a hive can have a population of 50,000 honey bees. Queen bees don’t just laze around while the other bees do all the work. In the summertime, a queen can lay up to 2,500 eggs in a day. Sounds exhausting! Ever wonder how a honey bee makes its signature buzzing sound? A honey bee moves its wings at a rate of 11,400 strokes per minute. Honey bees actually have 2 sets of wings: one larger, outer set and one smaller, inner set. With all those wings, it’s no wonder that a bee can fly at a rate of about 12 miles per hour. In their relatively short lifespan, worker bees certainly are busy! The worker bees in a hive fly an average of 55,000 miles to produce one pound of honey, visiting approximately 2 million flowers in the process. Honey bees have five eyes, three simple eyes that are used to detect light and two compound eyes that are used to detect motion. Bees can even recognize faces, in much the same way as humans do! Bees are excellent communicators. They use pheromones and a waggle dance to share important information like the location of a new nest, pollen and water. Do you have honey bees on your San Diego property? While many people think of bees as a pest, we hope that learning some of these honey bee facts helps to put them in a different light. If you have a bee colony living on your property, do not attempt to remove them on your own. Bee removal can be dangerous work – don’t risk your safety. Call the professionals at D-Tek Live Bee Removal. D-Tek Live Bee Removal is your local bee removal expert, specializing in safe and humane live bee removal in San Diego and throughout San Diego County. We completely remove your bees and the honeycomb so you don’t have to worry about the bees returning to the same place in the future. You can feel confident knowing that your bees will be rehomed with one of our trusted local beekeepers. For bee removal, bee repairs and bee proofing at your home or business, call our team today at 760-224-3040 for a free and instant quote.